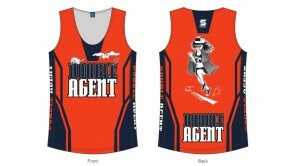 Sublimated singlet with logo on front and the Women's Double Agent on the back. Please keep in mind that the women's DA singlets are fitted less than the DA tees in the chest/ mid-section region. Sizes: X-Small- Chest 29-31", Waist 24-26"